to join up with everyone, to vigil (stay awake) for our right to speak, but found myself first folding into another group, marching and chanting for Immigrant Rights. I had the wrong sign, but I got right in step. “Education not Deportation!” and then we circled up and soon we were yelling, “I Believe That We Will Win! I Believe That We Will Win!” and jumping up and down, all eight hundred of us, jumping up and down to the beat of the chant like children, joyous, and I started to cry. But before that there was different crying, in the room with the thousand pointless chairs, where Kazim Ali, Tracie Morris, and I led some writers, who included my sister, through a series of breathings and movings and imaginings, all of which had to have been the simplest of beginnings, the most obvious of necessary thinking with our bodies, and yet I noticed that it had taken so very little to encourage the tears of at least five people, crying because someone had said, breathe. After that there was a moment when I met Jive Poetic, whose work will be detailed next post or two, who, to put it briefly, is an Insurgent Poet creating events with others, events that are readings, actions, and gatherings for learning such as coat collections, he told me, and when I’d asked whether the Insurgent Poets was a closed or an open group, he said, “When you’re trying to start an avalanche you don’t audition snowflakes,” and we laughed so hard about that, twice. I was on the train, tired and reading, with my little cardboard sign that said “Prez: Read a Book” leaning on my shin, when a guy across the car said, “James Baldwin” and I said right. It was my mother’s copy of Another Country, which I had no business bringing to DC, as the pages were ripping, the back cover having fallen off, and I wanted to preserve her notes, though I couldn’t read them. 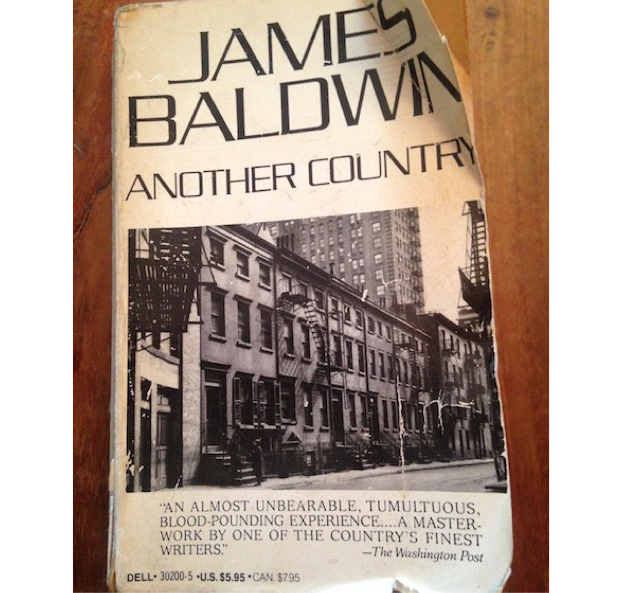 But soon we were deep in it: Baldwin in Paris, and why did he go, and what it had meant for my co-passenger to have read The Fire Next Time as a teenager and his brother too, who’d been in the military and who, having traveled the world, would always say there is no place more racist than America. Then we leaned closer and with even more urgency: how can we have a president who hasn’t read Baldwin or anyone else, who cannot read or write, whose policies and language seek to entrap, disable, deport, disinform, and destruct, so that suddenly it was our stop and the doors were almost closing; we bolted and made it out, first him and then me, though I stood still for a moment, unsure whether in fact this was my stop, or if instead I’d just leapt because he had and I wanted somehow to stay with him. I flew home the next day through a jolty rough sky with the gift of a Bomb sticking out of my bag and read there the amazing poems of Frances Richard, one that speaks of the Nigerian girls, saying only “girls” in such a way that we know which girls, but as if they are all girls, and her care, Frances’s, makes a space for the broken heart to break more. I will end this post with her question: “how / to notate distance, terror” and only answer that she does, because writing — because books — are the social project.